This article is ostensibly about a fascinating character named Robert J. Lang. He has a Ph.D. in applied physics from Caltech -- credential enough in my book. In the Internet collapse of 2000 he bailed out of a normal tech job in (or near) Silicon Valley. He had been doing Origami since the age of six and now became one of the first full time professional Origami scientist/artists. You see above a sample of what he can do. See his brilliant website for more. It is worth the trip. Lang has developed his Origami skills to such an extent that he has been commissioned by the Lawrence Livermore National Laboratory (sanitized from its toxic former name the "Lawrence Radiation Laboratory," which is how it was known when I grew up in Berkeley in the 50's), for example, to plan how to fold a telescope with a hundred meter diameter lens so that it could packed into a rocket and fired into space. Wow! The story of Lang's development and his achievements is beautifully told in the Orlean article. Fascinating though it is, it is not the point of this blog. At one point in Orlean's article, near the end, we read that an unnamed "mental-health professional" presented a paper at a 1991 conference on "Origami in Education and Therapy" in which she asserted that her "most rewarding of experiences was that of observing the effect that Origami had on psychopathic killers." I will pause while your mind boggles, as did mine when I read this. Having surfaced this astounding observation by a "mental-health professional" Orlean drops the subject and moves on to a humdrum account of a meeting of the West Coast Origami Guild in Orange County. You can skip over this part of the article. Excuse me, Susan, but what effect did Origami have upon psychopathic killers? You owe us. 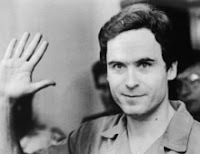 What about Ted Bundy (at least 30 murders)? 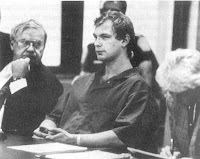 Or Jeffrey Dahmer (17 murders)? Were they, or others like them, driven to serial murder by the maddening frustration of finding themselves unable to make proper Origami storks? Did they plan their murder sprees while maniacally folding paper into obscene or violent shapes? Did they torture their victims by forcing them to fold paper? Or, once in captivity, did they become immediately becalmed by the pacifying pleasure of partitioned paper? Did they lose all interest in murder and transfer their savage impulses to folded paper? While sitting on death row at the Florida State Prison did Bundy make Origami models of Old Sparky? It is gross, I admit. But some mental-health professional has written of the "effects of Origami on psychopathic killers," and Susan Orlean has quoted her, but we are left to wonder. I am indebted to Robert J. Lang himself for a reference to at least one psychopathic killer who does origami -- Charles Ng. 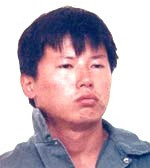 Ng was one of two perpetrators of the Motherlode Murders in the foothills of California in the 1980's. He and his partner, Leonard Lake, were thought to have committed upwards of 25 murders in which they kidnapped, tortured, sexually abused, videotaped and murdered 26 or more people, the exact number remains unknown. Lake ultimately did the decent thing and killed himself. Ng fled to Canada, was apprehended and returned to California where he was finally convicted of 11 murders and sentenced to death. Ng now resides on death row at San Quentin. You see him above. You see him below as he looked then. 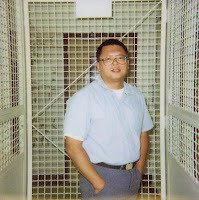 A Canadian group opposed to the death penalty, the Canadian Coalition Against the Death Penalty, which offers free web pages to death row prisoners, has taken up Ng's cause and provided him with a web page. We learn therein that Ng does indeed do origami because he says that he does. His text makes interesting if slightly demented reading. He characterizes himself as a victim of injustice: "My case, from inception to verdict, has been both a travesty and outrage of mistreatments and miscarriage of justice." He flirts with the spectre of racial persecution (or is it a macabre form of racial pride?) -- "I am currently the only Chinese prisoner" on death row, then lapses into New Age sentimentality: "To me, art is a universal emotional expression of all cultures, and wildlife art a spiritual reference for all things wild and free; and a way for me to immortalize my love and intimacy to those who are dear and special to me...." Perhaps, Charles. But then there is the matter of those videotapes where you are shown debasing young women. "In captivity, Brenda was seen on tape tied to a chair, pleading for her life as her husband, son, friend Stapley, and others watched in horror. The Asian untied her and she was forced to strip naked before being put in leg-irons and sexually abused by both Lake and the Oriental." Here, apparently, origami is a way for the psychopathic killer to say, "see, I fold paper, I cannot be all bad...."